The initial Accessory Dwelling Unit (ADU) ordinance was adopted effective November 16, 2016. For a copy of the 2016 complete ordinance, please click here. A new revised version became effective December 1, 2018. To view a copy of the new ordinance, please click here. 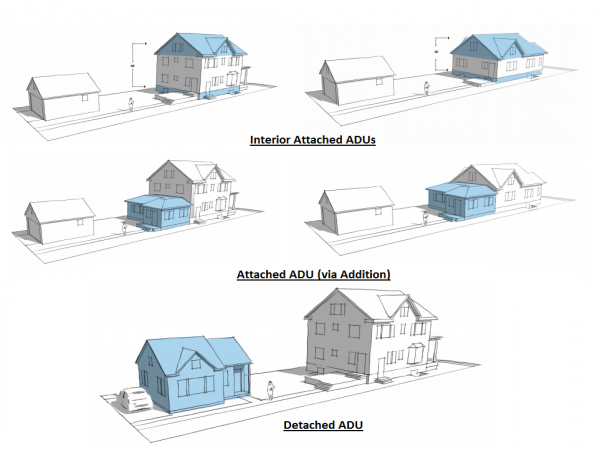 An ADU is a second dwelling unit, subordinate to a principal one-family dwelling, within or attached to a one-family dwelling or in a detached accessory building on the same zoning lot. Lot size must be at least 5,000 square feet in order to construct a detached ADU. Only one accessory unit is allowed on a lot. No more than one family is allowed in both the principal unit and the accessory unit together. A family is a lineally related family plus two, or up to four unrelated persons. The property owner must permanently reside in either the principal unit or the accessory unit. The maximum size of a detached ADU is 800 square feet of floor area and the maximum height is lesser of 25 feet or the height of the principal structure. All other requirements for an accessory structure must be met. If the accessory dwelling unit is located within the principal unit, the principal structure must be at least 1,000 square feet and the accessory unit cannot exceed 1/3 of the total floor area of the structure. If the principal has more than one story, the maximum floor area of an accessory dwelling unit may be equal to that of the first floor, but shall be less than or equal to 50% of the total floor area of the structure. There must be a sidewalk from the street to the primary entrance of the accessory unit. An accessory unit on the upper floors of the principal structure shall have an interior stairway to the primary entrance of the accessory unit. Secondary stairways may be located on the exterior, but not on the front of the building. Provided that the parking requirement is met for the principal one-family dwelling, no additional parking is required. All building code requirements for the accessory unit must be met and a building permit must be obtained for the change of use and/or construction work. The property owner must fill out a Declaration of Land Use Restrictive Covenants and Owners' Warranties (form to follow) with the County Recorder. Before a building permit can be issued to establish the ADU, the property owner must submit an original of the Declaration, which includes the date and document number to the zoning administrator. The building permit application must show compliance with all standards for an ADU. After the construction of the dwelling unit has been completed, a building Certificate of Occupancy will be issued by the building official. Every year thereafter, the property owner will be required to file an annual affidavit with the zoning administrator verifying continued owner-occupancy of the property as their permanent and principal residence. An annual review fee of $63.00. The accessory dwelling unit cannot be sold separately from the principal dwelling unit, and may not be a separate tax parcel.